Audi's concept E-tron supercar has now hit the road. AutoWeek gave it a spin, finding that despite its apparent similarity to Audi's gas-powered R8 sports car, the E-tron is a completely different beast. In fact, the only part the R8 and slightly smaller E-tron share is the windshield. Everything else is different--including, obviously, the lithium-ion-powered, all-wheel-drive electric powertrain. Two massive rear electric motors, and two smaller front electric motors drive the car, with 30 percent of the total torque delivered to the front and 70 percent to the rear. 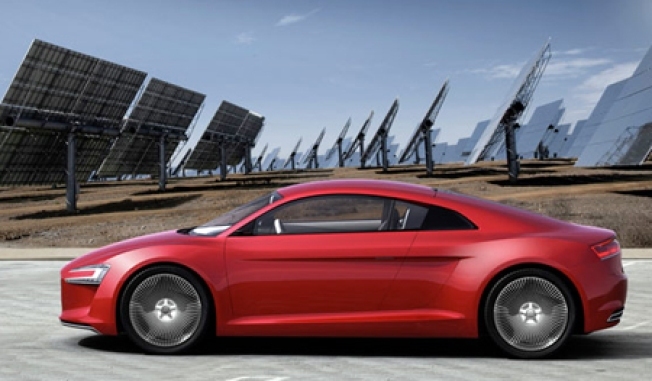 The 42.4 kw/h battery pack offers a 155 mile range. The 168-inch-long production E-tron will be limited to 125 miles per hour, hit 0-60 in 4.8 seconds, and cost somewhere north of the V10-powered R8's current list price of $155,100. AutoWeek found in a brief test drive that the Tesla Roadster outperforms the E-tron, at least in concept form--since the concept was limited to 60 mph and weighs more than its still-heavy production target of 3,300 pounds.